This is the first time that I have been invited to such a gathering, and probably the first time that a Norwegian journalists’ conference invited a group of people to discuss the climate issue. My impression was that the journalists more or less now were convinced by the message of the IPCC assessment reports. This can also be seen in daily press news reports where contrarians figure less now than ~5 years ago. But the public seemed to think that the scientists cannot agree on the reality or cause of climate change. I find that the revelation of a perception of the climate problem within the climate research community that doesn’t match that of the general public problematic. What I learned is that this also seems to be true for the journalists: it was stated that their perception of climate change and its causes were different to the general public too. The panel in which I participated consisted of a social/political scientist who had investigated how media deals with the issue of climate change and the public perception thereof, a science journalist, an AGW-skeptic, and myself. Despite the name of the place, the debate was fairly civil and well-behaved (although the AGW-skeptic compared climate scientists to mosquitoes, and brought up some ad hominem attacks on Dr. Pachauri). The science journalist in the panel advocated the practice of reporting on issues that are based on publications from peer reviewed scientific literature. I whole-heartedly concur. I would also advice journalists to do some extensive search on the publication record of the individuals, and consider their affiliations – are they from a reputable place? Also, it’s recommended that they consider which journal in which the article is published – an article on climate published in the Journal of American Physicians and Surgeons is less likely to receive a review of competent experts (peers) than if it were published in a mainstream geophysics journal. Finally, my advice is to try to trace the argument back to its source – does it come from some of those think tanks? But I didn’t get the chance to say this, as the debate was conducted by a moderator whose agenda was more focused on other questions. Short of telling the journalists to start to read physics in order to understand the issues at hand, I recommended the reading of Spencer Weart’s ‘The Discovery of Global Warming’. The book is an easy read and gives a good background about the climate sciences. It also reveals that a number of arguments still forwarded by AGW-skeptics are quite old and have been answered over time. The book gives the impression of a déjà vu regarding the counter arguments, the worries, politics, and the perceived urgency of the problem. I would also strongly recommend the book for the AGW-skeptics. One reservation I had regarding the discussion is being cut off when I get into the science and the details. I had the feeling of taking part in a football match where the referee and all the spectators were blind and then tried to convince them that I scored a goal. The problem is that people without scientific training often find it hard to judge who’s right and who’s wrong. It seems that communication skills are more important for convincing the general public that scientific skills. Scientists are usually not renowned for their ability to explain complicated and technical matters, but rather tend to shy off. I’d suggest that journalists should try to attend the annual conferences such as the European (EMS) and American (AMS) meteorological societies. For learning what’s happening within the research, mingling with scientists/meteorologists, and because these conferences have lot to offer media (e.g. media sessions). Just as journalists go to the Olympics, would it not be natural for journalists to attend these conferences? – but I missed the opportunity to make this suggestion. Hell seems to be fairly dead on a Sunday afternoon. I almost caught a cold from the freezing wait for the train – although the temperature was barely -3C. This January ranked as the third warmest in Oslo, and I have started to acclimatise myself to all these mild winters (the mountain regions, however, have received an unusually large amount of snow). Our minister of finance was due to attend the meeting to talk about getting grief, but she didn’t make it to Hell due to a snow storm and chaos at the air port (heavy amount of wet snow due to mild winter conditions). I would also characterize most EEs as technological optimists, who are convinced we can design ourselves out of any problem–teraforming Mars and Venus if necessary. Hell, most of them don’t even really believe that the speed of light is an insurmountable cosmological speed limit. What always floors me, though, is how certain they are in their skepticism, despite their complete noncomprehension of the physics. I would also note that EEs are not alone. A lot of physicists in highly specialized disciplines have no greater appreciation of the physics of climate change, but are equally adamant that it either isn’t happening or that we’re not responsible. #40 The BBC may think they are winningly impartial, but many, many people in the UK consider the opposite – that they are biased towards ‘liberal’ points of view. Just check out a site called http://www.biased-bbc.blogspot.com/ for an example. Jacqueline. I search-engined-oogled “most trusted news” and it looks like many many people in the whole wide wide world consider the BBC to be the most trusted news source. As your own list shows the BBC quotes scientists verbatim (in quotation marks). But Hank’s post #98 shows what other news sources can do. If you could give me a list of your own impartial sources I’d be grateful. Re #99 where Andrew challenges: “Perhaps some electrical engineers can speak up and enlighten us about their world”. BTW the results do not match reality. “These results could arise due to errors common to all models; to significant non-climatic influences remaining within some or all of the observational data sets, leading to biased long-term trend estimates; or a combination of these factors.” Santer, B.D., Penner, J.E. & Thorne, P.W., (2006) Chapter 5 in Temperature Trends in the Lower Atmosphere – Understanding and Reconciling Differences. We all know that the Arctic sea ice is rapidly disappearing as a result of global warming. But the scientists main interest seems to be how this is happening. While Rome burns, they fiddle with their theories of the NAO, polar gyres, ocean currents, winds, and melt ponds. No wonder the general public think the scientists are confused, when they see them arguing over such urbane matters. Rasmus tells the journalists to read peer reviewed papers, but only those which from authors who are part of the establishment. Most of those papers are written for fellow experts and are incomprehensible to scientists working in other fields far less journalists. Of course this is well known and many papers are accompanied by press releases. But what do they say? Each report of a climate catastrophe seems to be printed with an escape clause saying that there is no proof that this event was caused by AGW! If we could see some honest admissions of when the models get it wrong (Arctic sea ice?) instead of the self congratulation when they occasionally they get it, then we engineers might have a little more faith in the scientists, even if we still distrust their models. Global temps dropped 0.5C or more during 2007. The preliminary January data shows the declining temperature trend is even accelerating so maybe there really is something to the current calm cool sun. With all due respect I don’t think that’s a good analysis at all. Indeed, the best, cheapest, and fastest way to reduce global warming pollution from the energy sector is increased efficiency — maintaining a materially comfortable lifestyle through less energy-intensive means — and that is a matter of the application of “human ingenuity” to the improvement of our technology, reducing waste, etc. You write that some believe it is easier to “use human ingenuity to modify nature” and then give as examples “non-fossil energy technology, moving cities inland [and] geo-engineering”. But of those, only geo-engineering is “modifying nature”. Implementing non-fossil fuel energy technologies is certainly a desirable application of human ingenuity that is crucial to mitigating AGW (and to providing needed energy to many millions of people in the developing world), but it does not involve “modifying nature”. It involves modifying our technology and adopting new technologies that reduce our “modifications” of nature. Nor is moving cities inland to escape rising sea levels “modifying nature” — it is a modification of the human infrastructure that may become a desperate, costly and disruptive necessity if we fail to mitigate AGW. The problem we face is that we are rapidly and destructively “modifying nature” in ways that undermine the prospects for the sustainable materially comfortable lifestyle that our “human nature” leads us to desire, and we are “modifying nature” not through the application of “human ingenuity” but through human ignorance, shortsightedness and greed. It’s hard to see how self-destructive behavior arising from ignorance and greed could be a “moral approach” to anything. PLENTY of atmospheric scientists in there. I will have a look at the other points you and the others make and be back to you before you know it! Holly Stick (93), you are theoretically correct, but the behavior change is so far remotely unlikely to make the idea completely hypothetical. People will not change their behavior (let alone nature, as you say) in a large scale way until the “disaster” or whatever is literally staring them in the face and breathing hot air down their shirt. Even your example of WWII was like that. Throughout 1940 and 1941 when Hitler was rampaging through Europe and bombing hell out of England, and Japan was creaming and torturing China and the far East, the vast majority of Americans were clamoring to just ignore the whole thing — Even talking of impeaching FDR for sending war equipment to England. The chain of learning goes: 1. Understand, 2. Believe, 3. Modification of action. The average state of AGW is in the middle of understanding. Getting through belief (by the masses) into modification is going to be a great slog. Line up and compare your situation with FDR in 1941. Unfortunately, for the AGW protagonists, it looks exceedingly bleak. It seems to me (a skeptic, but trying to be helpful, here) until some wizard finds a magic bullet, you have to just keep slogging and flailing away. Andrew (99), as an electrical engineer by education but little professional practice, maybe I can shed some light. Electronic engineering models are and must be extremely precise. When you’re modeling a processor that switches nanoamps every half nanosecond — well that’s cutting it pretty fine. Of course we are very proud, not to mention pedantic and arrogant, of this situation compared to other models, which are nowhere near as accurate. The fact that there is absolutely no need for those models (civil engineering, climatology, etc., etc.) to be anywhere near the precision of say, SPICE, (GCMs within a few hundred kilometers and a couple of decades, e.g.) to produce totally usable outputs certainly is not going to stop us from huffing and puffing and thumbing our noses! There’s a big difference here: economic reality depends in part on what people know, believe and value; physics does not. Proposing to change the way economic systems work makes sense – indeed, we know they have changed (and have been changed) radically in the past. Proposing to change the laws of physics does not. I don’t pretend to know anything about how the solar magnetic field might influence our climate, but an episode of Naked Science airing this weekend on the National Geographic channel discussed this, suggesting there is a link, vaguely invoking the effects of changes in the solar magnetic field associated with sun spots on cosmic rays. The experts who raised this point were Dr. Judith Lean of the U.S. Naval Research Laboratory and member of the National Academy of Sciences (http://www.nrl.navy.mil/content.php?P=AWARDS2003) and, I think, Dr. Michael Lockwood of the Royal Astronomical Laboratory. I have no way of judging the veracity of their comments, but they come across as believable, if not very specific. From RealClimate: “It is possible that GCRs do have an effect on climate through the modulation of clouds, but I don’t think it is very strong.”-rasmus, 3/2007. This mirrors IPCC 2007, which dismisses the GCR effect as being small. Of course, to discover it to be significant would be a disaster for many in the mainstream of atmospheric science; ’tis best to take a vote and hand wave it away. I believe that paper is also an adequate response to Ray Ladbury’s request in #92. That’s true Ray. The last thing this EE said was RC is a pack of lefties. That’s political alright but not on this end! It’s the models they think they understand but Barton said it best. They see it as tweaking to get a desired output. This isn’t being done though, but that is what the Libertarian EE’s see: what they want to. Richard S. Courtney, PhD, climate and atmospheric science consultant, IPCC expert reviewer, U.K. – as Desmogblog put it if Courtney has a PhD he got it in a box of crackerjacks. Freeman J. Dyson, PhD, Emeritus Professor of Physics, Institute for Advanced Studies, Princeton, N.J. – Theoretical particle physics, but no atmospheric scientist. Don Aitkin, PhD, Professor, social scientist, retired vice-chancellor and president, University of Canberra, Australia. Ernst-Georg Beck, Dipl. Biol., Biologist, Merian-Schule Freiburg, Germany – another Dipl. teaches in secondary school. Sonja A. Boehmer-Christiansen, PhD, Reader, Dept. of Geography, Hull University, U.K.; Editor, Energy & Environment journal – social scientist, Princess Denial. Part of the issue with engineers is they are quite prepared to toss basic physics, chemistry and biology overboard. SecularAnimist in 107, you seem to be working very hard to find a narrow interpretation of my words to avoid recognizing my point: There are other rational approaches to the issue besides yours . They may be better or worse than yours due to varying correctness of assumptions or estimates of future events, without being irrational or necessarily immoral. SecularAnimist> It’s hard to see how self-destructive behavior arising from ignorance and greed could be a “moral approach” to anything. The following sentence in quotes is not intended as an attack against anyone; it is to show that there is another side that could be right, depending on what the real (some undiscovered) facts are, however unlikely you consider that possibility. A short google search shows that she is indeed a member of the NAS. But a recent article I found shows her casting doubt on the assertion that the sun has played a significant role in the global temperature increase in recent decades. In any event, I don’t think she was discussing her own original work in that article but was evaluating other work. Real scientists do engage in debate about these issues. If I understand correctly, the IPCC doesn’t ignore the possibility of solar influences on climate, but in balance they came to the conclusion that any effect in recent years has been small compared to that of greenhouse gases. Science never settles things completely. It is always possible that the consensus will prove to be mistaken about the effect of greenhouse gases and that climate change in recent years has been dominated by subtle gamma ray effects that no one purports to understand. I don’t personally believe that will happen, but if it does, we will find out about through the peer reviewed scientific literature, not from broadcasts on the National Geographic Cable Channel. I haven’t watched that channel much, but the few times I have, I found the presentations varied considerably in quality. You have to keep in mind that cable channel operators are under constant pressure to come up with more material. It is entertainment that they provide, not scientific instruction. Re #108 (Alan K): Many of those listed qualifications are an exercise in puffery. Very few of the listed people actually have the qualifications to back up the stated assertions. Richard Coutney, e.g., doesn’t even have a PhD, yet both lists identify him as having one. You might ask yourself how that happened. Ray (102) says, “…The right seems utterly convinced that it is an excuse for social engineering….” As I said earlier, a fair number of AGW protagonists bring it upon themselves. Pretty deep pigeon-hole of EEs there…. Going back to media coverage of science previously referred to by Andy Revkin and Spencer Weart, there’s an appropriate and insightful quote by Bill Blakemore, a long time reporter for ABC News in a book,just out, by Mark Bowen titled “Censoring Science-Inside the Political Attack on Dr. James Hansen and the Truth of Global Warming”. In an e-mail to Jim Hansen, Blakemore states “….what makes the difference between a propagandist on one side and a professional journalist or scientist on the other is not that the journalist or scientist ‘set their biases aside’ but that they are open about them and constantly putting them to the test,ready to change them.” He cites as one of his guides in his attitude to Karl Popper, who taught us that science unlike dogma is always subject to disproof. Also early on in the book he quotes a senior headquarters(NASA) veteran as stating a “cardinal rule quite succintly:”Don’t f—(the blanks are mine) with the science.” This ought to be emblazoned on the lawn of the Capitol. You’ll meet some old friends in this book including Gavin, Andy Revkin,and Stefan Ramsdorf, as well as some of those still worshipping at the altar of dogma and ignorance. Alan K, check that list of eminent climate scientists. This one for example, know the problem? You have to check everything on this kind of claim. One interesting thing about the theory on the approaching Maunder like minimum is that it will be simple and non-controversial to prove. If the sunspot count doesn’t rise as expected then they could be on to something, if it follows the normal curve for cycle 24 then, well it didn’t work as a theory. Rod B. (#109), you put the finger on the right spot. It is an uphill battle, and ‘human nature’ has a lot to do with that. But note that banging your head against reality (what scientists and the occasional informed lay person are doing) is fundamentally different (on the honesty/dishonesty scale) from denying reality. can someone read this and comment regarding the Sun and the disappearance of sunspots. I guess Alastair McDonald got a degree of BS in EE. For some reason denialists like to write “approaches” in plural, even while the only approach they’ll allow is to Do Nothing. PLENTY of atmospheric scientists in there. Sure… but not ‘most’. Your links are making Ray’s argument for him. It becomes even worse if you only look at scientists actively publishing in the field: then as far as I can tell, only Roy Spencer is left. Of course, verbal assent to such a statement is different from actually being prepared to miss out on that plasma TV or foreign holiday – but your certainty that behaviour cannot be changed substantially is unwarranted: consider recent changes in smoking behaviour in North America and western Europe. You are right that denial is a powerful mechanism – indeed, I believe you yourself present a clear example of its power – but it only shows its full power when integrated into a strong ideological or mythical framework. In the case of the USA in WW2, this was the belief that Americans had left behind the evils of Europe, and would be safe if the USA avoided foreign entanglements. In the case of AGW, it is most often a quasi-religious reverence for “The Market”, although Alexander Cockburn provides an interesting exception. Fortunately, I believe this reverence is crumbling. In the USA, Katrina was a significant turning point, but I think the current cr*dit crunch caused by the sub-prime mortg*ge crisis will have far greater impact. Ref 125 We have been round this mulberry bush several times. There is correlation with the Wolf number for sunspots at the maximum of the cycle and temperature on earth. No physical connection has been established. Just because cycle 24 is slow to start is only an indication that the maximum Wolf number may be low, and hence that global temperatures might fall. We will have to wait 5 or 6 years to find out. Pete Best, Hmm, an article on climate science where not a single climate scientist is quoted. I think that speaks volumes for its lack of credibility. Bottom line: The current solar cycle started about a year late. It may well be a wimpy solar cycle, but most solar scientists predict it will be well within historical limits. And even if we were to have a Maunder Minumum, it would last for at most decades, whereas the contributions of CO2 last centuries to millennia. Like total solar irradiance, galactic cosmic rays show no significant trend up or down over the last fifty years. So how can they be driving the sharp upturn in global warming of the last thirty? Alan K. #108. The prosecution rests. #124 about “human nature” … Fundamentally a human individual matures until a certain age (say 25 years typically). That is a sculpting process about values and attitudes, habits, religious beliefs, methods of solving problems, often forming the most durable friendships and attachments to gurus. Later in life these features do not change. Knowledge may accrue later on, but if it challenges any of these (learned) basic personality features, it is rejected. By now most people have it in their hearts that a petrol pump really delivers happiness and freedom. Therefore they defend most vigorously their right to pay these extraordinary sums on every gas station. Changing a personality later in life has been compared to serious trauma, such as breaking a major bone. I hope some of you saw SIX DEGREES COULD CHANGE THE WORLD last night on NatGeo. Perhaps there will be some analysis of it. I personally don’t think it went far enough in bringing up possible dangers, such as carbon emissions from melting permafrost and hydrates, or possible hydrogen sulfide gas poisoning in a 6 degree scenario, as they think might have happened in the end-Permian. Pete, that should be showing up as a retraction by now if the people who posted it are ethical. It was a fake story from Investors Business Daily (which has a history of this kind of thing). Re 123, if sc24 is stretched and weak, it will throw some models of the sun predicting a strong sc24 in doubt. It has been hypothesized that sc25 will be very weak (see http://science.nasa.gov/headlines/y2006/10may_longrange.htm). But aside from proving or disproving models of the sun, two weak cycles will result in important consequences back here on earth. If both cycles are weak and there is no cooling, it will convince many skeptics that the AGW component is overwhelming the natural fluctuations. It will be interesting to see the results of the CERN “CLOUD” experiment when completed. There appears to be quite a good correlation between observed sun-spot activity and global atmospheric temperature (and other variables), and the initial laboratory findings of Svensmark et al. – the connection between cosmic rays and cloud formation, are intriguing. re #108 – I get the fact that Richard Courtney doesn’t exist as he is supposed to. Are you saying that every other one of those scientists is similarly discredited? So many people have written off all the signatories, I just emailed a couple of them at random to see whether they are who they are and what they say about the “you are not credible” tag. I will let you know what the response is but I really want to know if you think that each of the scientists who signed those letters is not to be believed. oh and #115 Eli that’s 10% of one of the groups. There is a similar description of some of the AR4 authors out there, I believe. Rando, #138, Of course it would work a whole helluva lot better if GCR fluxes were actually increasing. They aren’t. So how do you have an effect if your cause is absent? I’ll believe that (change of mind by many sceptics merely in response to evidence), if and when I see it. Re #135, the book 6 Degrees by Mark Lynas has been reviewed here, it found favour with the realclimate mob in fact I do believe. However I would not suggest that knowing what happens at 6 degrees is knowing what happens at 1 degree, its gets more speculative beyond 3C even though its based on sound science. Even science runs into prediction difficulties at 4+ C.
Well, given that the signatories themselves have summarily written off the 1,000+ strong team that’s the IPCC for various imaginary reasons… why should they be expecting privileged treatment? Maybe because they bring up the spectre of Galileo? Works every time, I see. a quick question/clarification of the “lists”: Are “expert reviewers for the IPCC” appointed by the IPCC or by other entities? Which gcr are you referring to, and what sharp upturn of the last 30 years? The sharp upturn stopped a decade ago despite accelerating CO2 emmissions, and we’ll need CERN CLOUD experimental results to get a better understanding about what sorts of bombardment generates what sorts of cloud condensation nuclei. As far as I can tell, none of the physicists working the GCR connection think there is a simple linear relationship between gcr of unspecific energies (especially using neutron flux as a proxy) and temperature. A good correlation between GCR and low level clouds has been shown. A high point of the Klimamysteriet documentary [#83] was Shaviv and Veizer telling their stories of how their research started and how their collaboration began, *after* they had both done their research, one from an astrophysical view, the other, geochemical. They dovetailed nicely. Of all of Svensmark’s citations it was Shaviv and Veizer 2003 that most convinced me of the viability of the GCR-climate connection, hearing both of them speak on how their research intersected was absolutely fascinating. Hat tip to Steve Bloom, who had debunked that story several days before you asked about it, in this very topic, response 63. Looks like Steve was the first person to actually check with the scientist named and flag that story as bogus. There should be an award for priority in flagging blatant lies online. 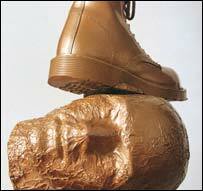 I’d suggest something like little bronzed unlaced boot, for truth trying frantically to get its boots on while a lie races around the world. Nick (128), I have no formal sources, only a response to what was presented as a major hurdle for AGW protagonists. If your referenced survey is accurate, that means the preponderance of the masses are well into the belief stage and there should not be that much of a problem getting the plan executed — though as you say (and I agree) often there is a wide gulf between what people tell pollsters and what they will agree to. I agree with you other point, though I would add that beyond rational analysis people prefer homo stasis and just hate to change. Cigarettes are not a good example because joining the quitters was considered and improvement in their lives; mitigating AGW is likely the opposite — the rose-colored economic analyses by some not withstanding. Thermodynamics does not enter climate science at all? Let’s see … hmmm, this is a toughie. Oh I know, Conservation of Energy. Thermodynamic phenomena and processes driven by energy addition to the Earth Climate Systems. Evaporation, condensation, solidification, sublimation, Equations of State, thermophysical properties of materials, stability of Thermodynamic processes, adiabatic lapse rate, moist lapse rate, etc. etc. etc. I guess consideration of all these, and all other aspects of Thermodynamics that impact Climate Science, are omitted from Climate Science. And an editorial opinion (thoughts stated without factual support) expressed in #116. And how are we to know if Eli Rabbett has qualified peer-reviewed Engineering publications, in all the right Engineering Journals of course, to state any facts concerning Engineering? Citations please Eli. Both to your Qualifications to judge Engineering and publications in which Engineers have tossed basic physics, chemistry and biology overboard. On the other hand maybe Eli “Who’s He” Rabett was referring to the finite time aspect. Well finite time just so happens to represent the actual time scale for all actually useful and physically realized thermodynamic processes.